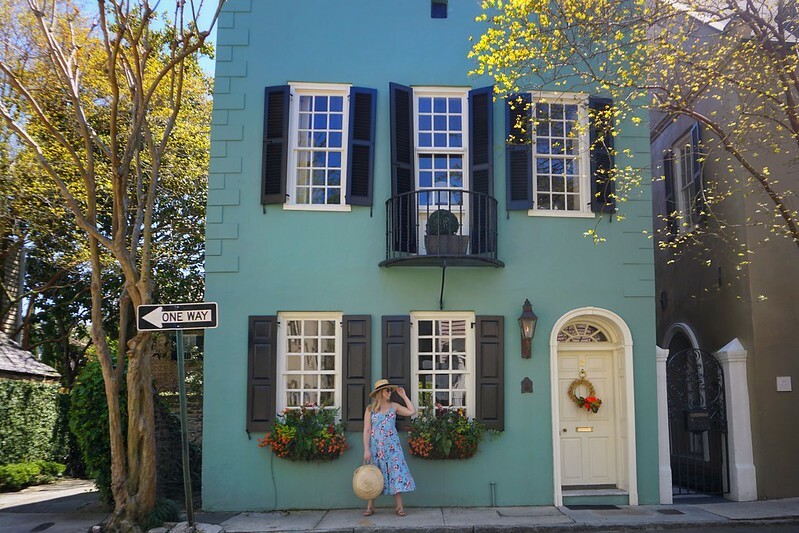 If you follow me on Instagram then you know that Megan and I just got back from 3 colorful days in Charleston, South Carolina, and I promised myself that I would get a guide (specifically a first timer’s guide) up ASAP in hopes that I will inspire you to book a spontaneous trip there like we did! 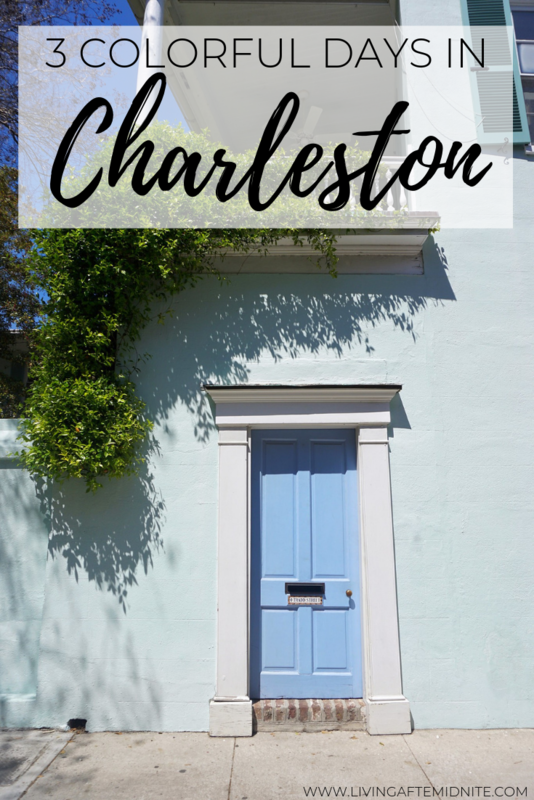 I knew Charleston would be amazing, but honestly it was WAY more beautiful then I could’ve ever imagined! The southern charm oozed from every corner and even though I just returned home I’m itching to go back. 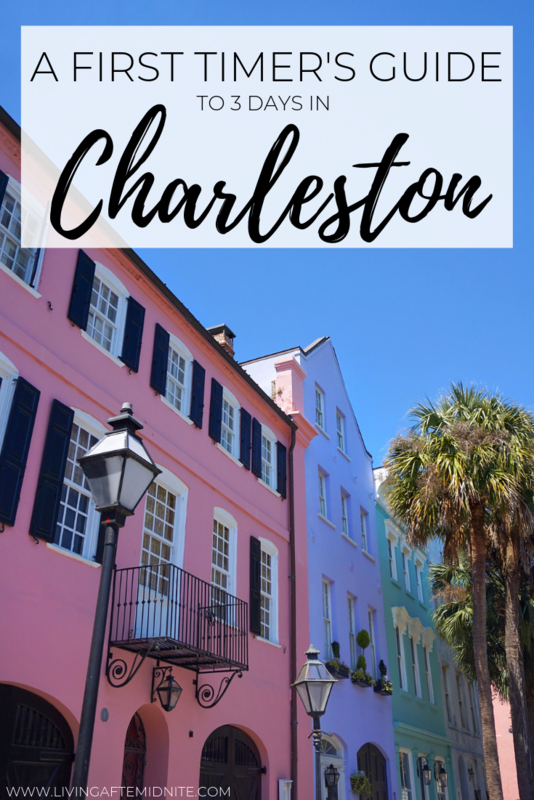 Since we only spent 3 days in Charleston I figured I would do a day-by-day recap of everything we did, so you can see just how much you can actually see (and do and eat) in just 72 hours! 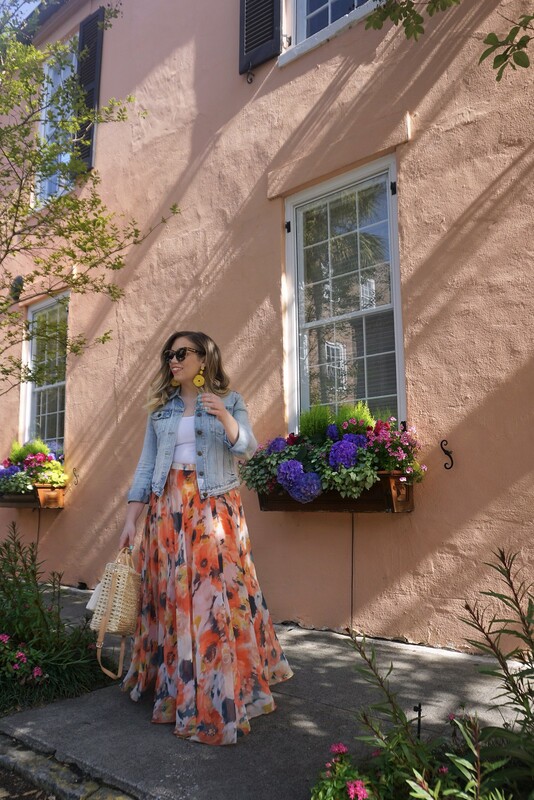 Shop my denim jacket, straw bag and Chicwish floral maxi skirt! 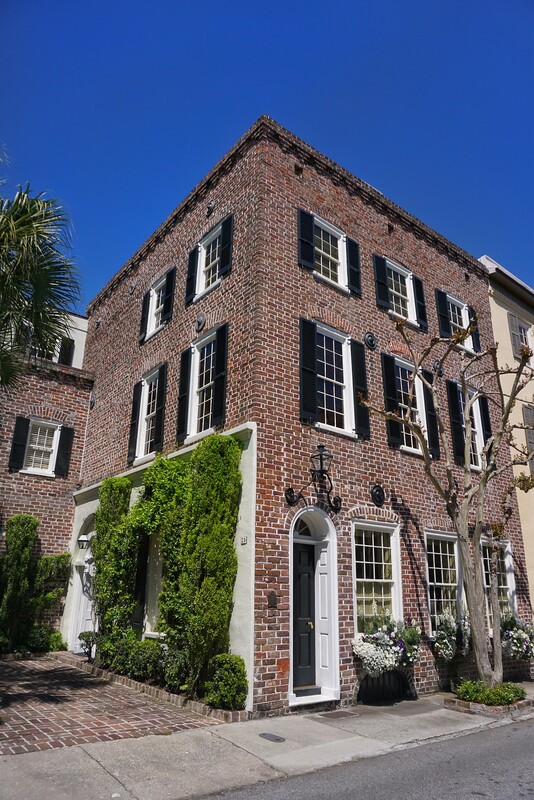 We took the first flight out of the New York and ended up landing in Charleston at around 9am. We crossed our fingers that our room would be ready at our hotel when we got there (check in wasn’t until 4pm), but luck was on our side and we were able to check in when we arrived at the Homewood Suites! 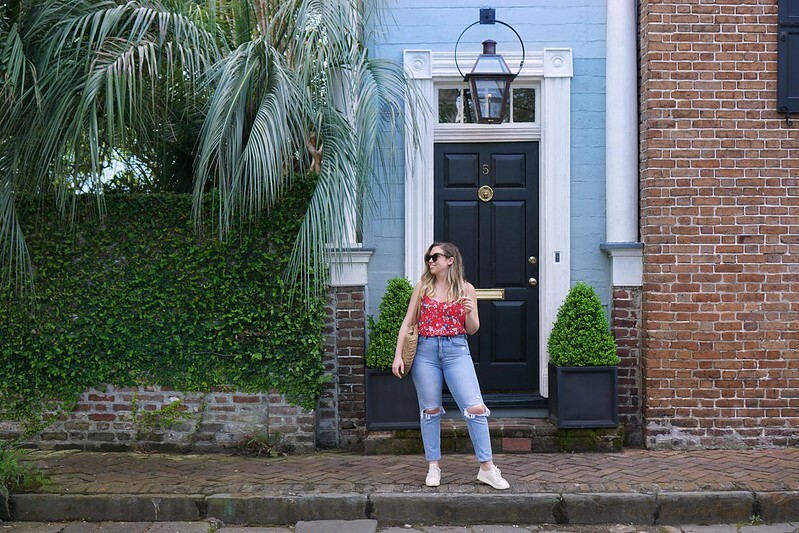 This was both mine and Megan’s first time in Charleston so we didn’t really have a preferred area to stay in, but we were really happy with the choice when we got there and saw the location and what was around it. First off it was an all-suite hotel so the room was AMAZING. So big (2 queen beds, living area, kitchen, bathroom, etc. ), clean and new plus they had free breakfast every morning and wine every evening. And it was located right between King St. and Meeting St. around SO much stuff and just a short walk to everything else. Shop our Soma Lemon Zest Pajamas – tank, shorts, robe & t-shirt/pants set (c/o)! Drybar, which was conveniently right near our hotel, booked us blowouts at 12:30 (which was a serious blessing because I was up super late the night before packing and didn’t have a chance to wash my hair) so we were looking for a quick place to grab a snack before that so we stopped by Glazed Gourmet Doughnuts on King St for coffee and doughnuts and they did NOT disappoint. Then we started wandering farther downtown. Like I mentioned it was both of our first time there so we knew right off the bat that we’d be spending a lot of time just walking around. 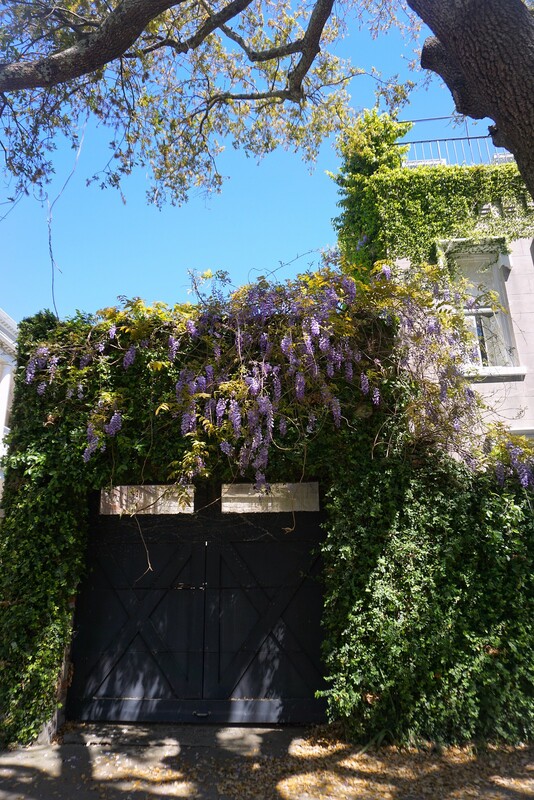 The most beautiful houses in the city truly are in the little streets and alleyways. 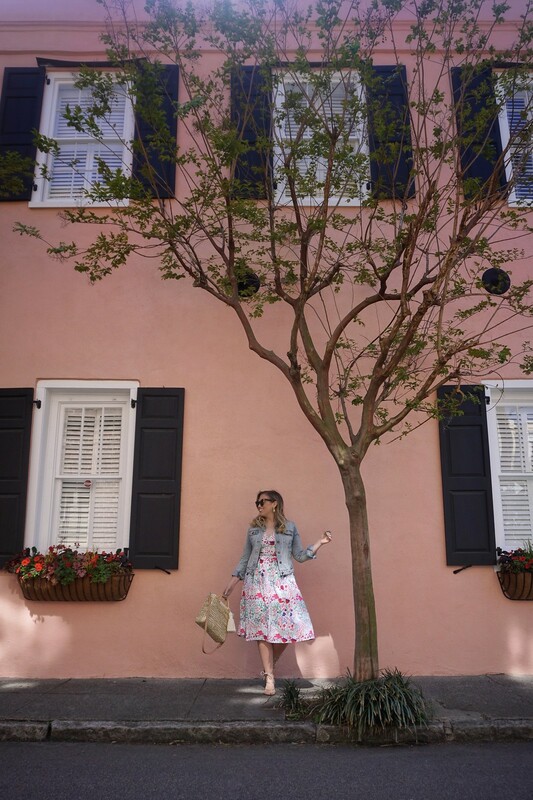 Shop my straw bag, denim jacket and custom eShakti floral dress (c/o)! 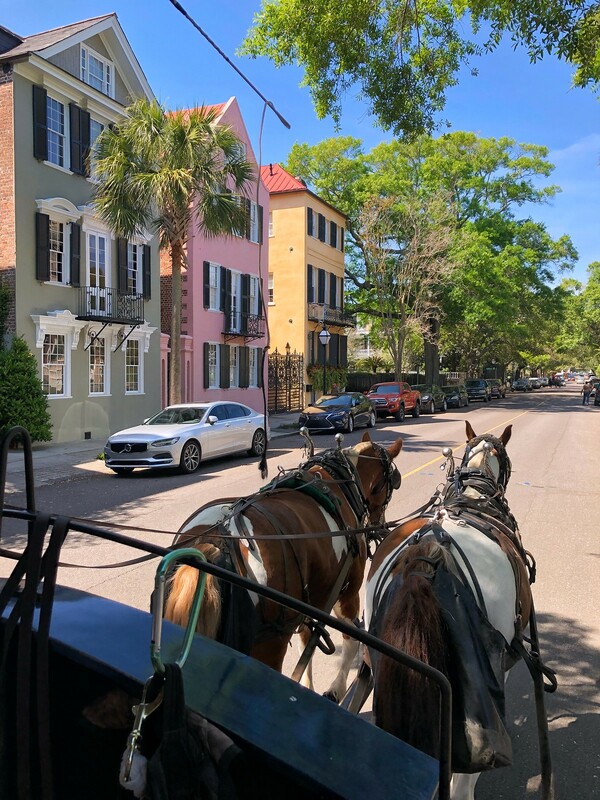 We booked a Carriage Tour with Palmetto Carriage Works for 2:30 and I can’t recommend it enough. Our tour guide was amazing and we learned so much all while seeing so much of the city. 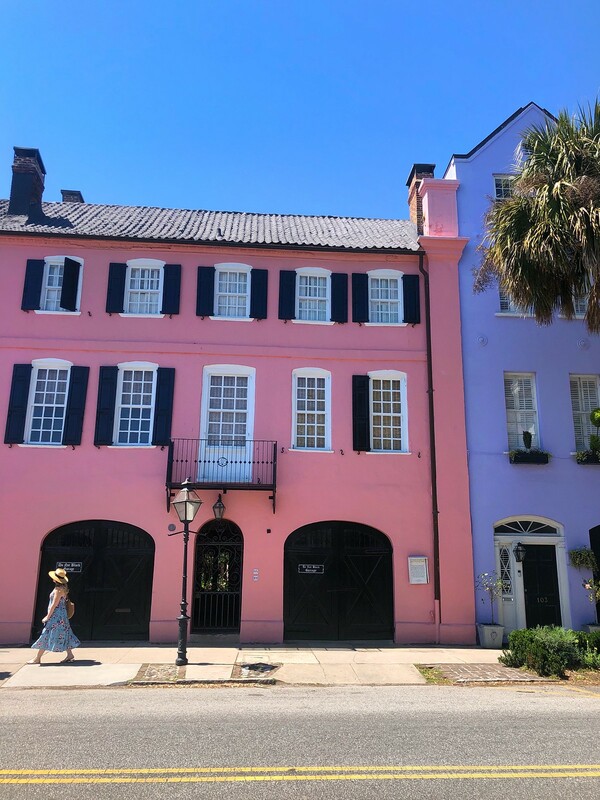 I’m really glad we did this on the first day we were there because we passed so many places we knew we wanted to revisit and really got a feel for the Historic District of city. 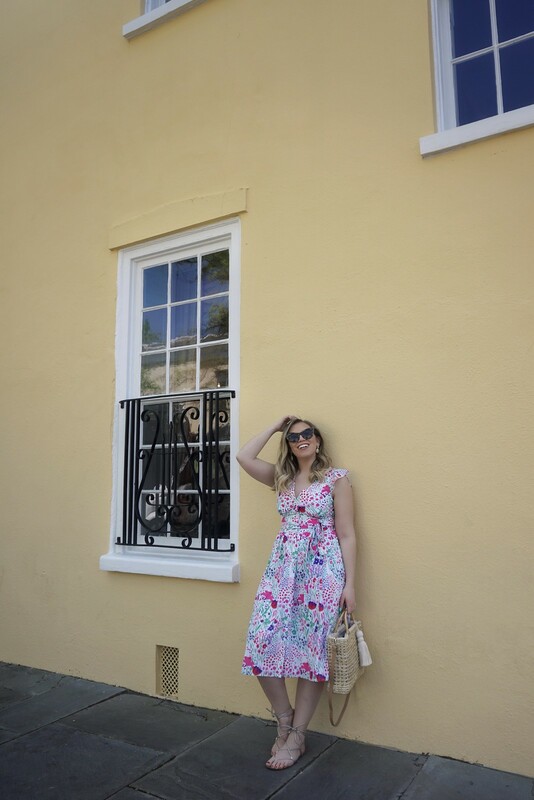 After that we walked back to our hotel to change and headed to dinner at 5Church Charleston! 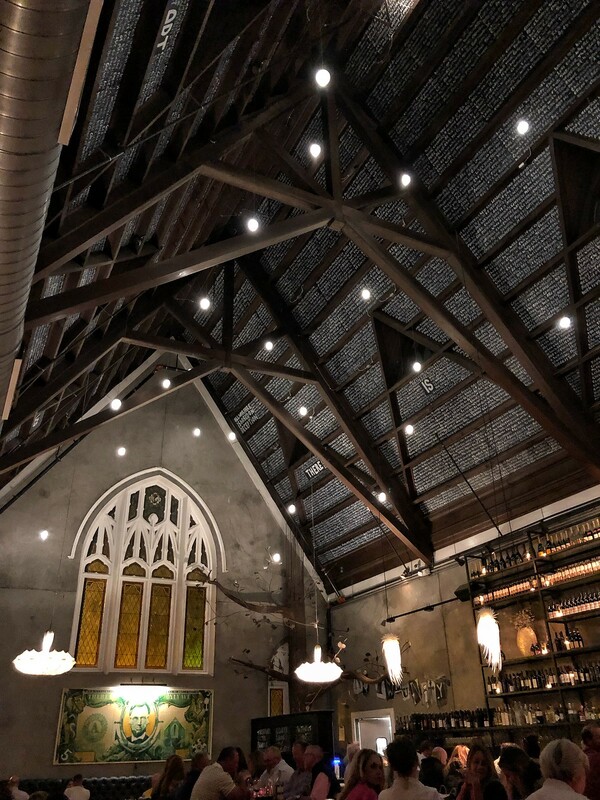 This place was SO cool, it’s in a former church and so beautiful. 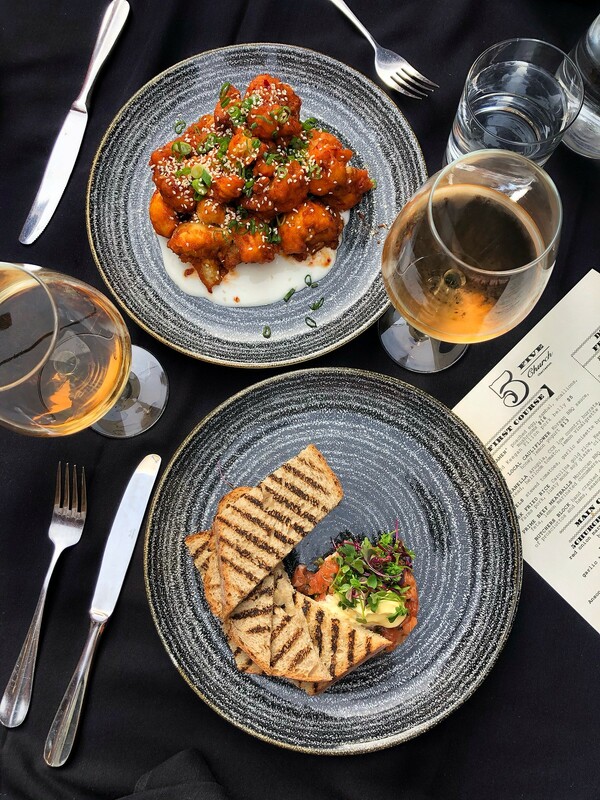 I highly suggest the Spicy Local Cauliflower as an appetizer and the Spicy Ahi Tuna Poke Bowl and the Fried Chicken as entrees. 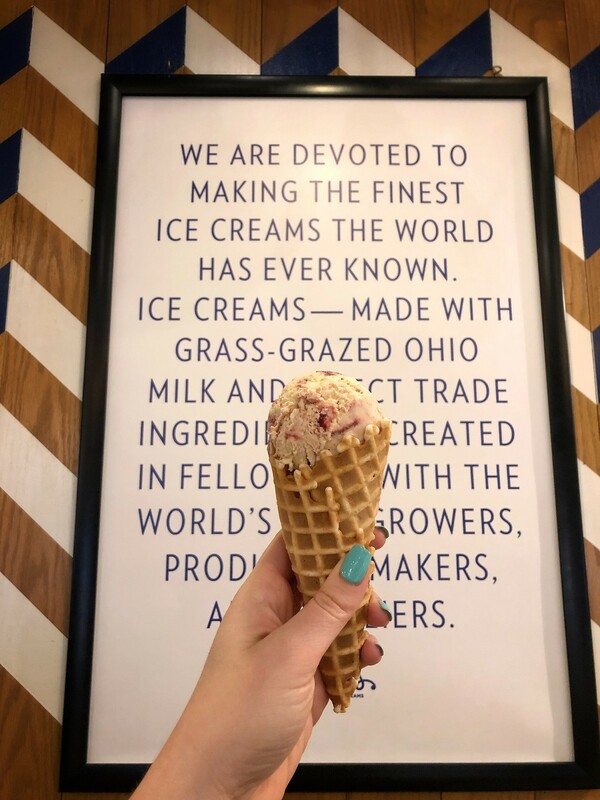 And of course after all that walking (over 22,000 steps that day) we ended the night with ice cream at Jeni’s Splendid Ice Creams on King St. I was super impressed with how many dairy free ice cream flavors they had and while I wanted them ALL I ended up with Roasted Peanut Butter and Strawberry Jam in a Waffle Cone (because the place smelled like them since they make them fresh) and it was so freaking good. 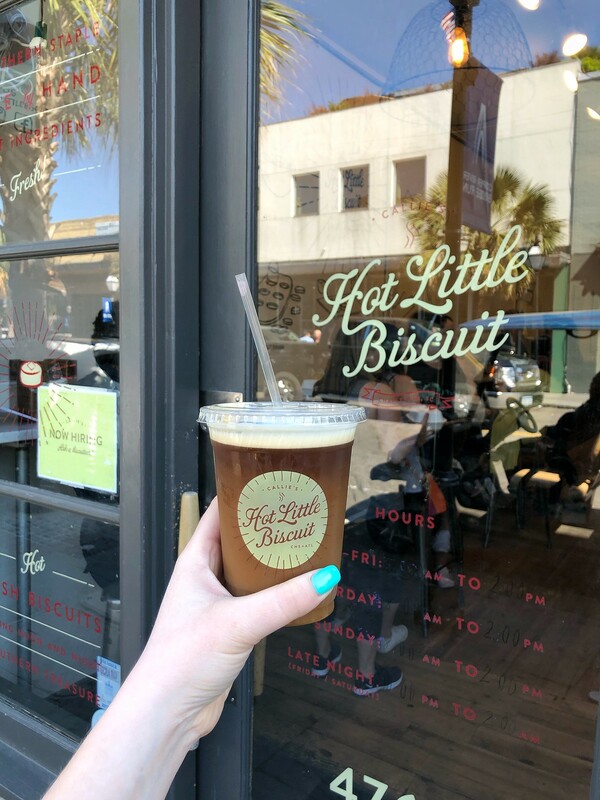 We started our morning with a trip to Callie’s Hot Little Biscuit because everyone told us that it’s not a trip to Charleston without a stop at Callie’s, and after trying it I can absolutely confirm. 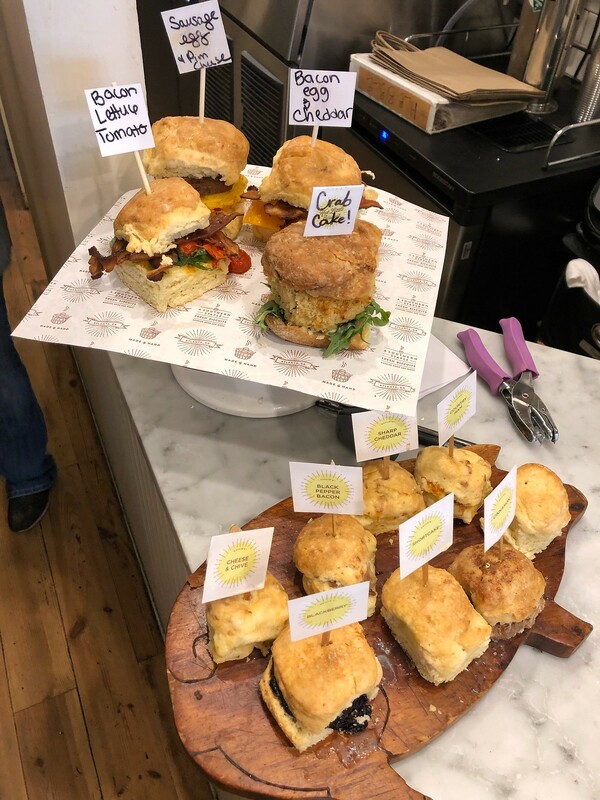 We literally got one of everything, so I can’t give you my favorite, but just make sure it’s on your list if you’re headed to Charleston. After Callie’s we did more wandering. 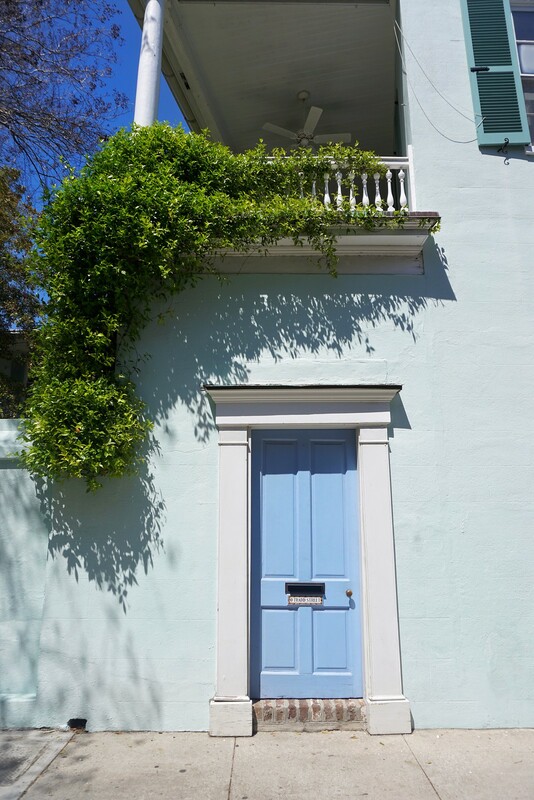 All the colorful houses and window boxes and southern charm were just beyond beautiful so I highly recommend just getting lost to find all the hidden gems Charleston has to offer. 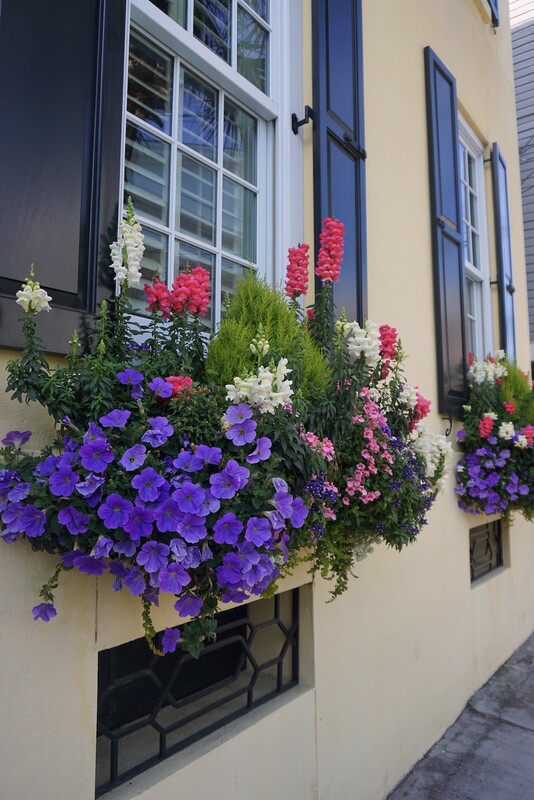 We also walked past Rainbow Row, and while it really was picture perfect I think that all the other houses in Charleston are just as beautiful (if not more so) and in my mind you can probably skip this tourist trap in favor of wandering through the streets of the French Quarter and South of Broad. 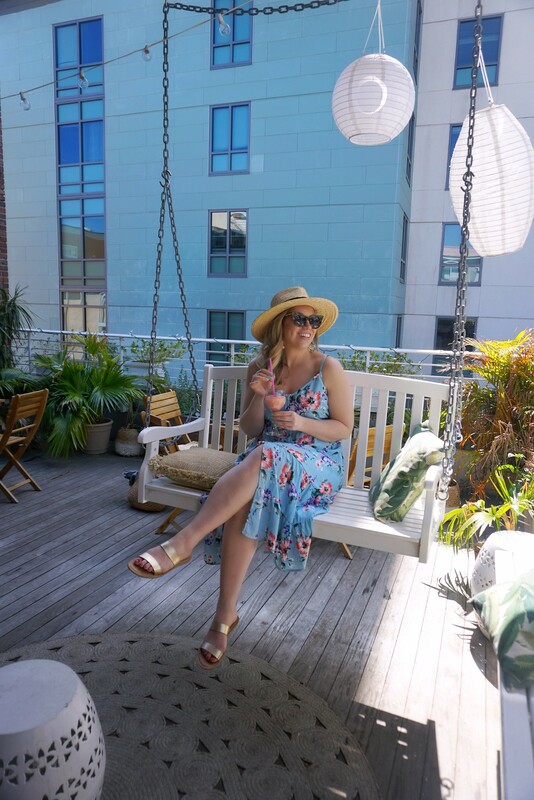 Shop my straw hat and blue floral midi dress! 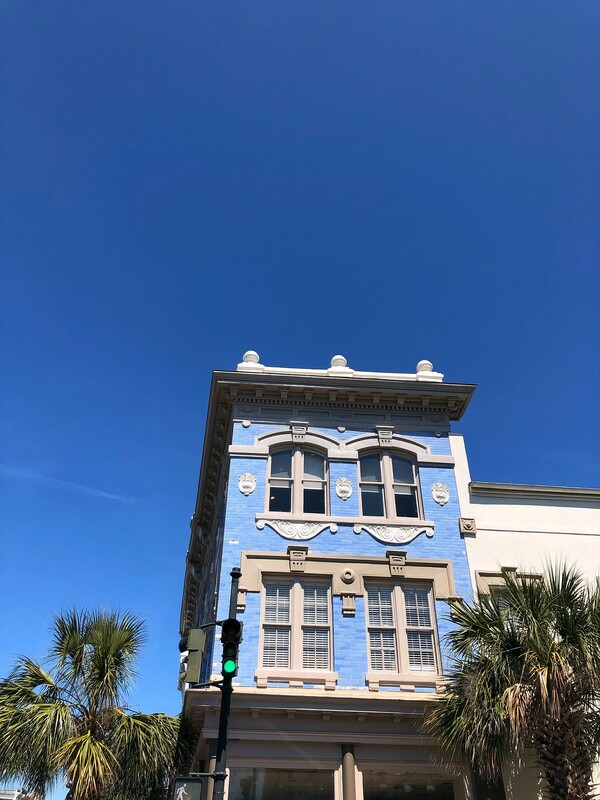 On our way back to the hotel we did a little shopping on King St and stopped at The Skinny Dip Charleston to kick off Rose Season with a glass of Froze on their rooftop! 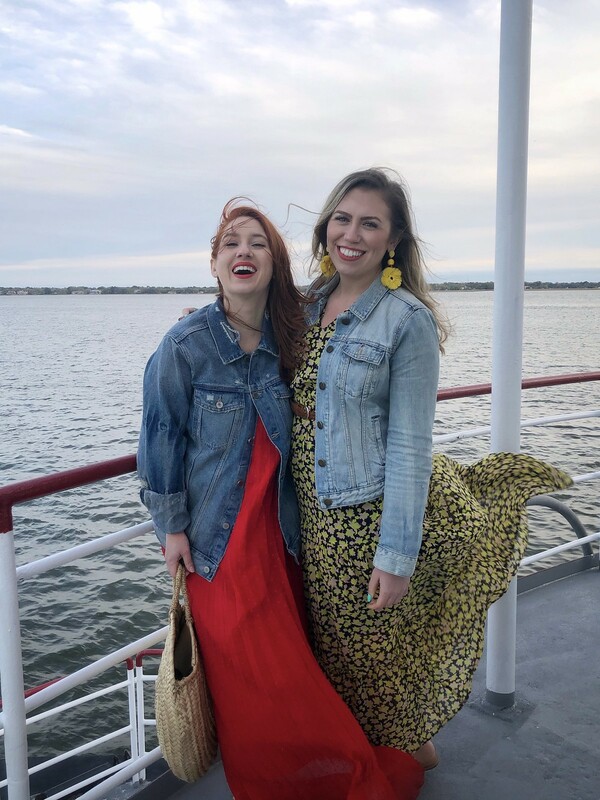 That night we set sail on the Carolina Queen for Blues and BBQ Boat Tour and while it was nice I don’t think I would recommend it if you’re visiting. I think I would’ve enjoyed their Harbor Tour with a guide that talked about the history rather than this, but you live and learn! 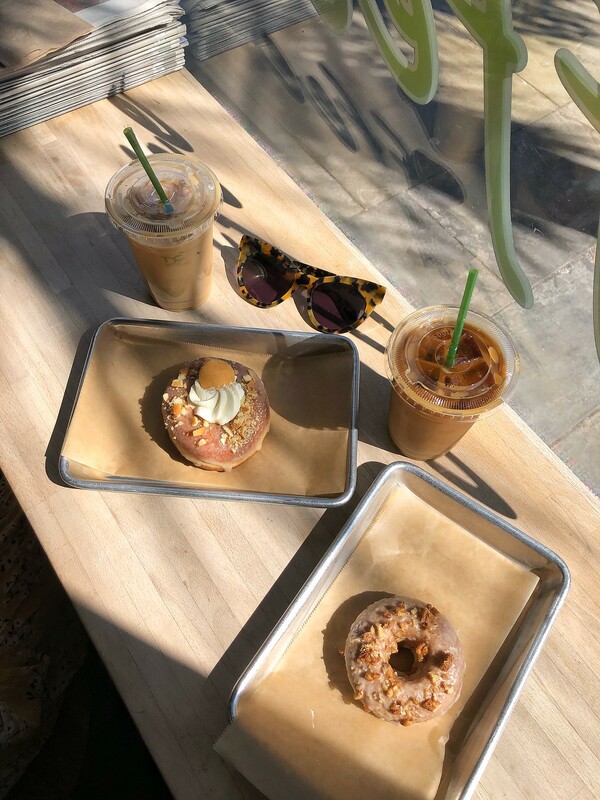 And don’t worry we made up for it with another trip to Jeni’s where I tried 2 more dairy free flavors (Cold Brew with Coconut Cream and Dark Chocolate Truffle) and then proceeded to drop an entire scoop on my jacket and dress. 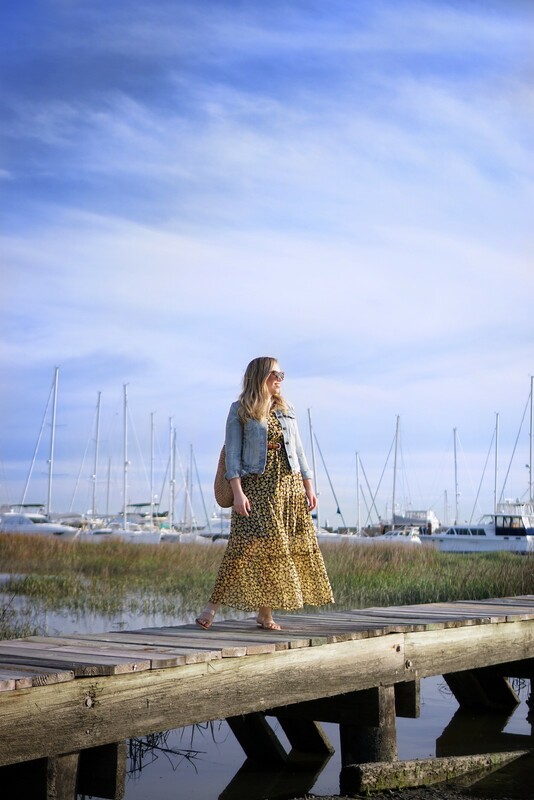 Shop my denim jacket, straw tote bag and yellow maxi dress (also available in plus size)! 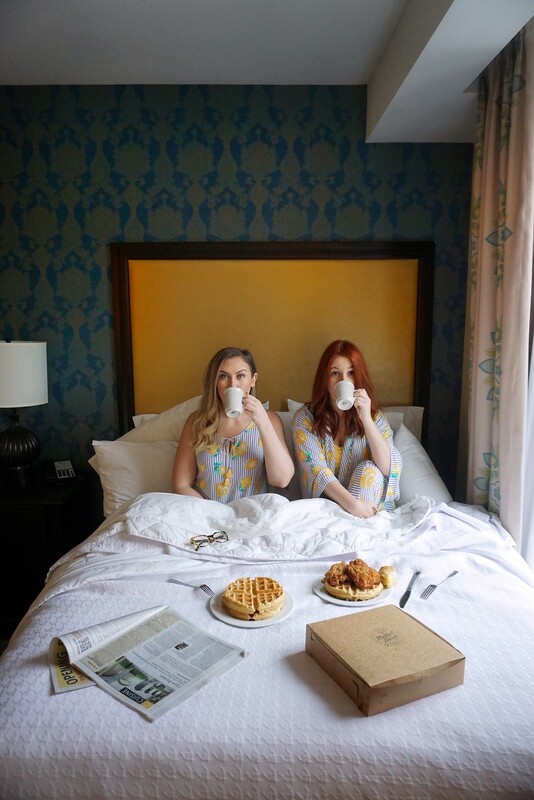 It poured all morning so we both caught up on a little work and shot something super fun in our hotel room (stay tuned for that!) 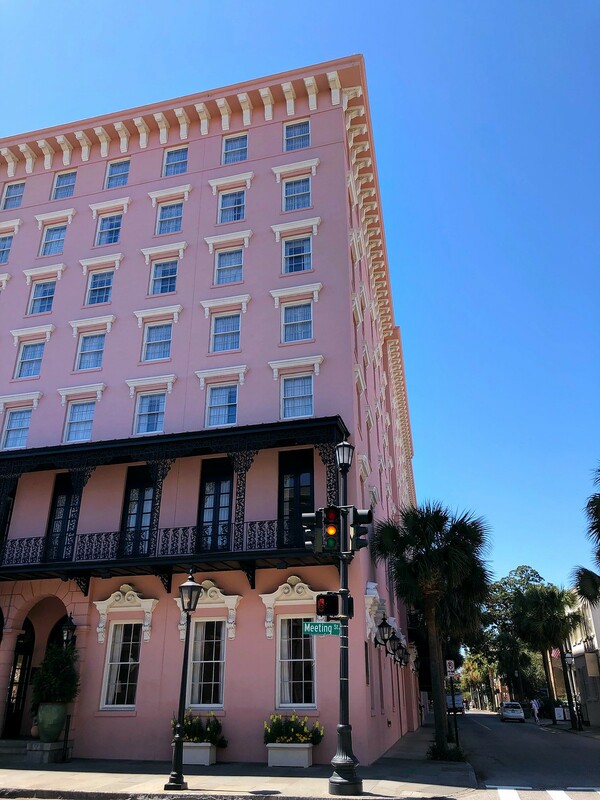 then we headed to the Amethyst Spa at The Restoration Hotel for massages and a little bit of relaxing after walking about 20 miles over the prior two days. I’m not one to visit the spa on vacation, but I was SO grateful we had the opportunity because it was seriously needed! Josh gave me my massage and I highly recommend requesting him if you do go, it was one of the best massages I’ve ever had. 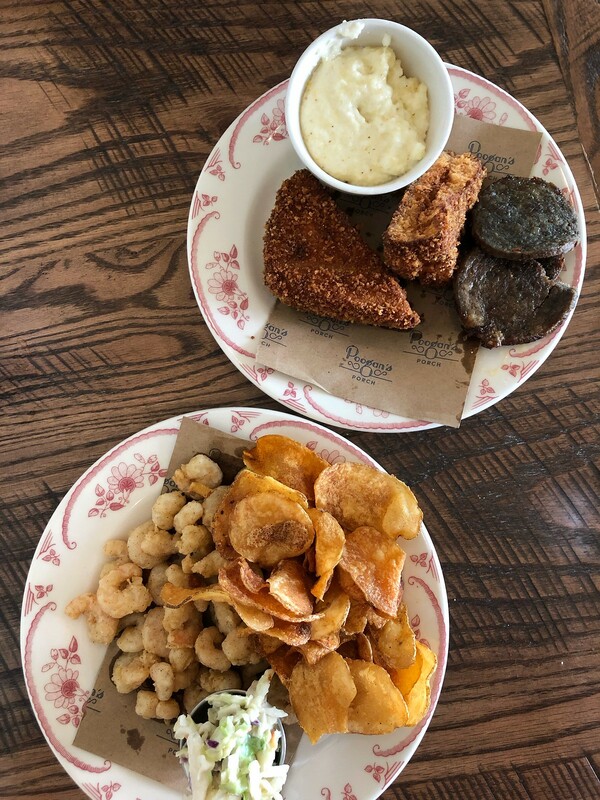 After massages we headed to a super popular Charleston restaurant, Poogan’s Porch. 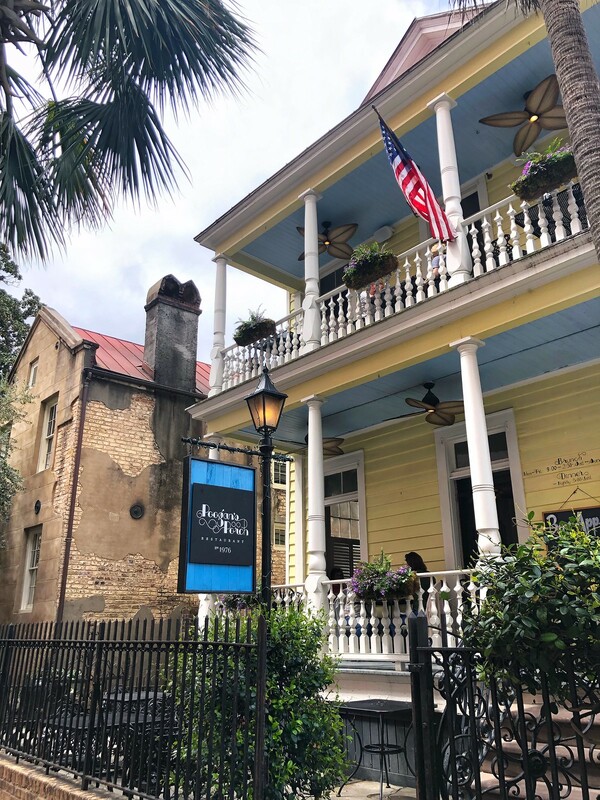 We heard it was hard to get into this particular restaurant and since we were only spending 3 days in Charleston we weren’t sure if we’d make it there, but we went for a late brunch/lunch and didn’t have a problem getting a table! 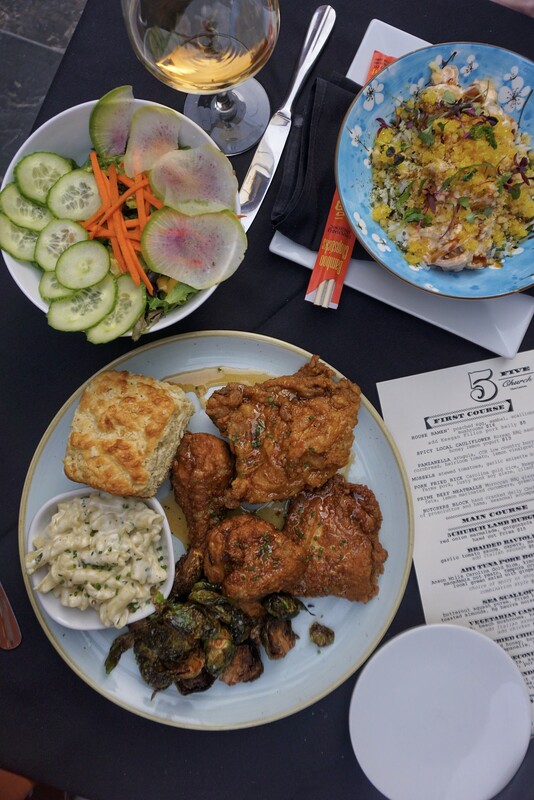 Order the Bloody Mary and the Pecan Encrusted Stuffed French Toast. 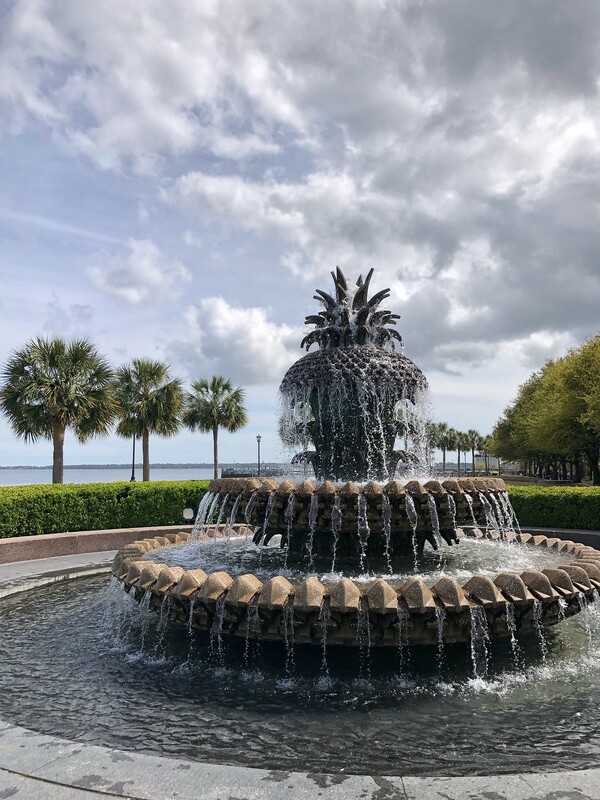 After that we wandered through the French Quarter and finally saw the Famous Pineapple Fountain in Waterfront Park before heading back to the hotel! 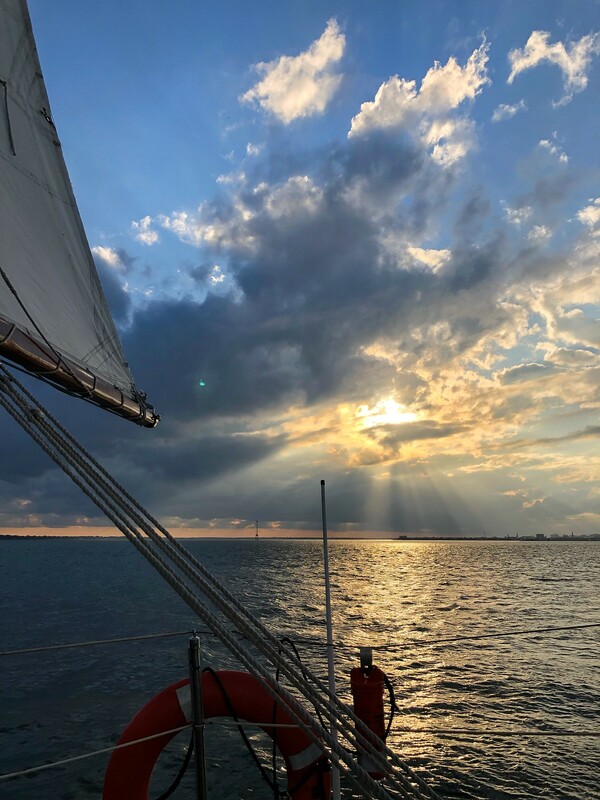 The weather cleared up in the afternoon, so we went on a sunset sail with Schooner Pride. 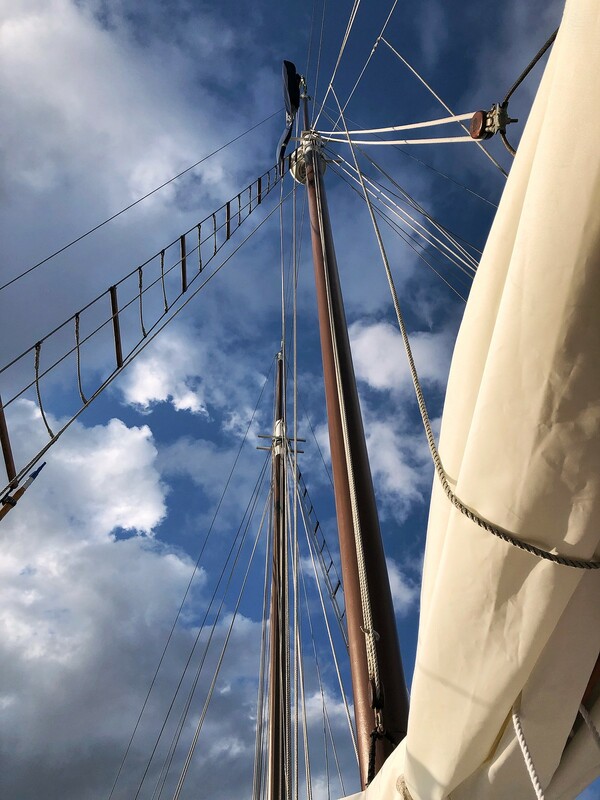 I’ve never been on a sail boat before so I was really excited about this and it did not disappoint! If you’re looking to do a boat tour this is the one to book! We ended the night with dinner at The Darling Oyster Bar! 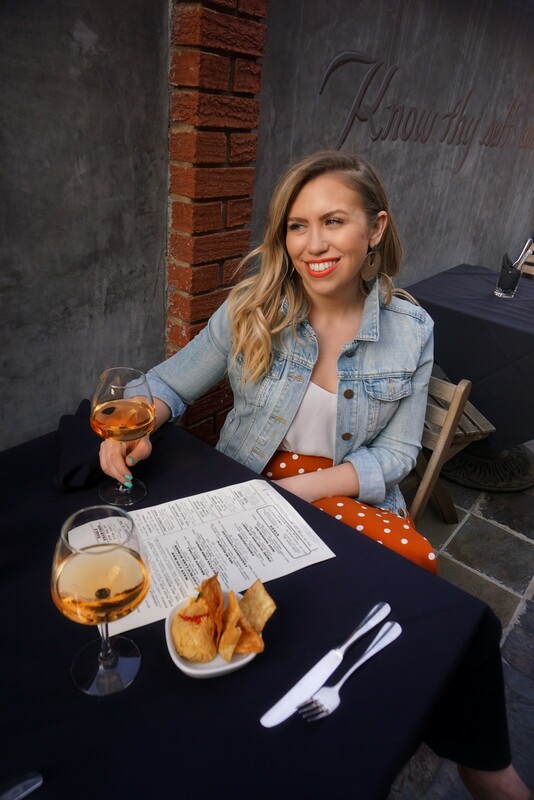 This wasn’t on our list of places to visit, but it was packed every night when we walked passed so we gave it a shot and it was great and so cute inside! 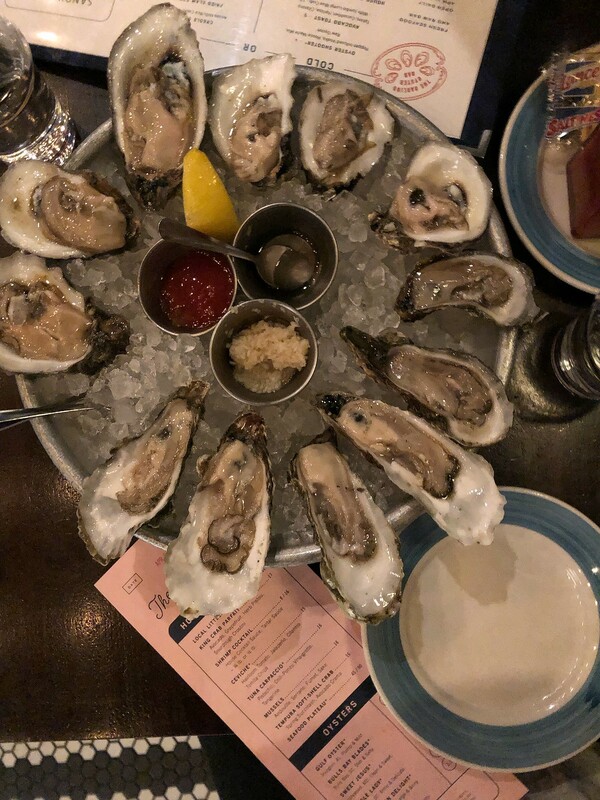 Order oysters (obviously!) and the Creole Shrimp and Key Lime Pie. 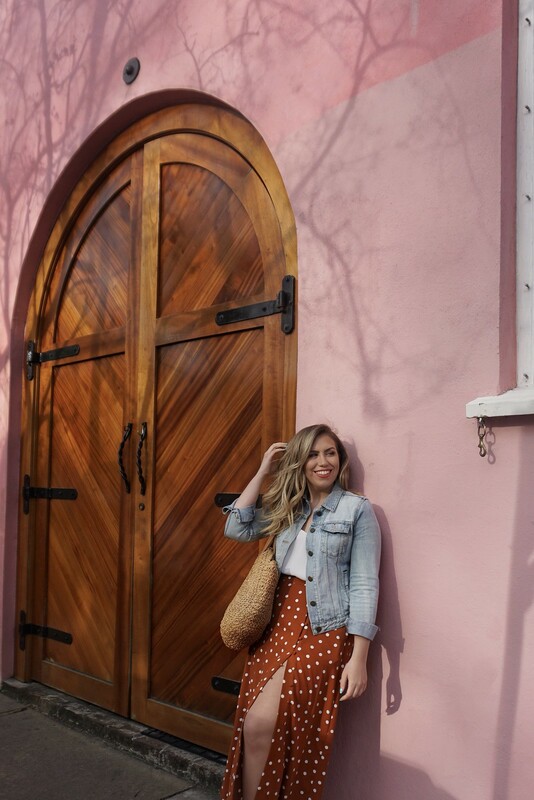 Shop my denim jacket, straw tote bag & polka dot skirt! We walked between 6 and 10 miles everyday so definitely bring your walking shoes! Also bring a hat and sunscreen, even in April we got a little bit of sunburn. If you’re doing any boat activities bring warm clothes because it’s definitely much cooler on the water. 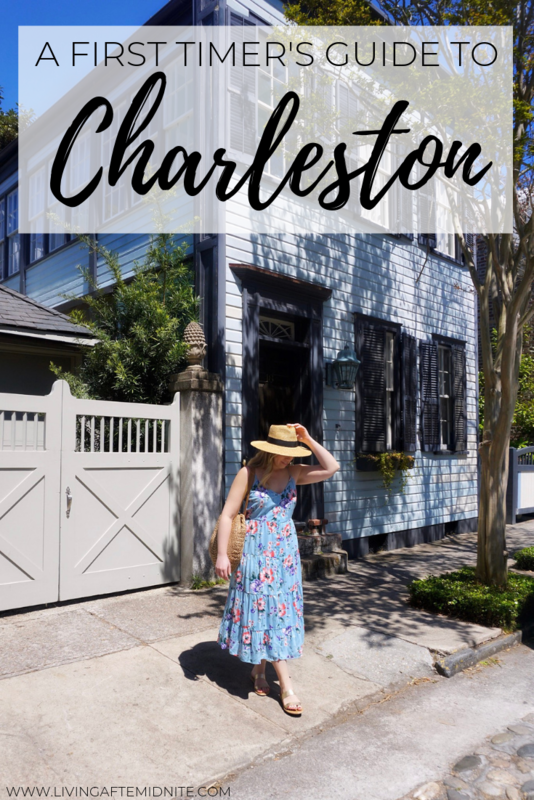 Make sure to leave plenty of time to just walk around, like I mentioned above the best parts of Charleston are found by just wandering around.